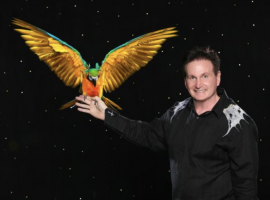 Hamner’s Unbelievable Variety Show opens soon and it is a must-see in Branson. It is definitely a variety show that incorporates many unique acts. Dave and Denise Hamner both have numerous years of experience performing. Dave is a phenomenal magician and his wife does a great job assisting him with his illusions. Tamra Tinoco and Jeff Brandt are two of the main featured vocalists in the show. Tamra and Jeff both perform several songs within the show. Besides incredible magic and singing, amazing dancing is also featured. AJ Heard and Kenny Brown bring incredible choreography to the stage. They both have years of performing experience and audience members will love watching them. On top of all this, two other performers bring exciting elements to the show. Mariya Serykh is an aerialist who performs a beautiful aerial silk routine. Anthony Soumiatin displays his unicycle and Cyr Wheel skills throughout the show. Each of these performers bring a thrilling aspect to this show. Audience members are sure to enjoy all of the wonderful elements in this show! 2018 Season in Branson is Underway Don't Miss SIX this Season!